The frescoes of the Elijah the Prophet church in Yaroslavl. The best churches are covered head to toe with art. Not that I’m complaining, but one of the problems of any sort of organized tour is the time allotted is too frequently less than I would like. Such was the case with our Russia river cruise to Yaroslavl with Viking River Cruises. The center of Yaroslavl is a Unesco World Heritage site. In Russia, it’s the only city other than Saint Petersburg where the entire center of the city has that designation. So, we were very interested in visiting it. Also, Yaroslavl is known as The City of Many Churches, so that just piqued our interest all the more. Yaroslavl was founded in the late Tenth Century by Yaroslav the Wise, a prince of Kiev. 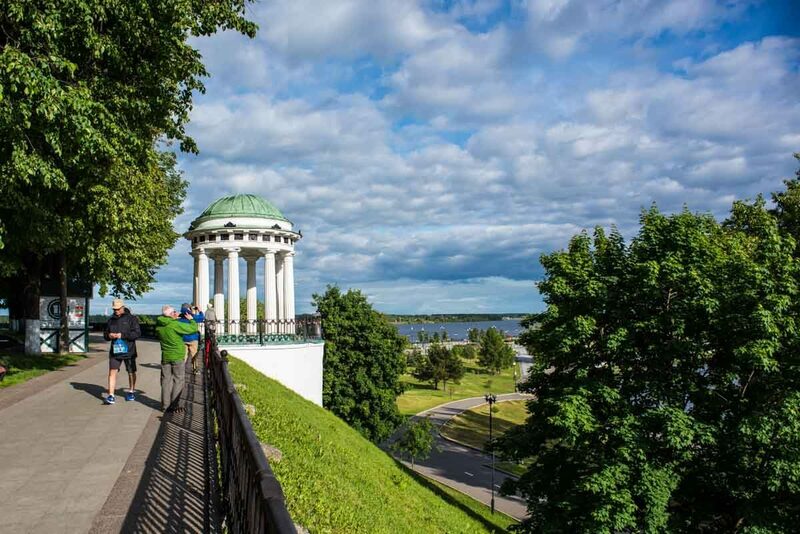 As such, it’s the oldest extant city on the banks of the Volga River, at its confluence with the Kotorosi River. The location, on the high banks over the Volga made the city more easily defensible. For the first five centuries of its existence, the city mostly prospered. But fires plagued the wooden city, and eventually the rulers decreed that all new building should be of stone, which is what you see in the city today. Since you can read a lot more about the history of Yaroslavl here, I won’t bother to go into too much detail. But the basic story is that because of its location at the center of trade routes, Yaroslavl grew and prospered even more, and eventually became the second largest city in the Moscow principality. It began to decline as a trading city after the founding of Saint Petersburg, but was able to remake itself as an industrial center, and so maintained its wealth, which is reflected in its architecture, particularly its churches. 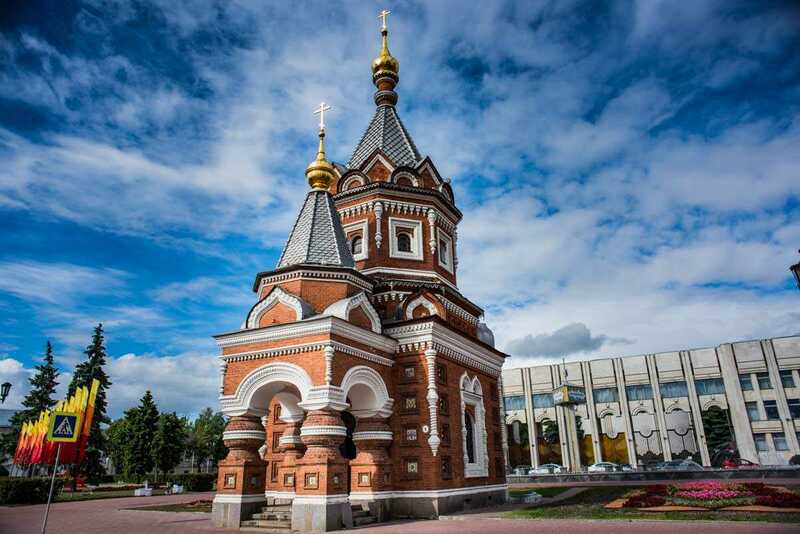 A walk around the center of Yaroslavl will introduce you to several of its famous churches. Unfortunately, since we were limited in time by our need to return to the boat, we didn’t get to see as many as I would have liked. So, here are a few of note that we did manage to see. The small chapel of Saint Alexander Nevsky was the first church we encountered. Unfortunately, because of the rush of the tour, no time to stop longer than to stick a head in. The Alexander Nevsky Chapel is a tiny chapel built in the late 19th Century, but sits on an open plaza surrounded by more modern buildings. As such, it’s a lovely oasis on the outskirts of the city center. The outside is more interesting than the tiny inside. The iconostasis, or wall of icons, typical of a Russian Orthodox church, reaches all the way up at Elijah the Prophet in Yaroslavl. The real gem of the churches we did have time to linger in was the Church of Ilya (Elijah) the Prophet. 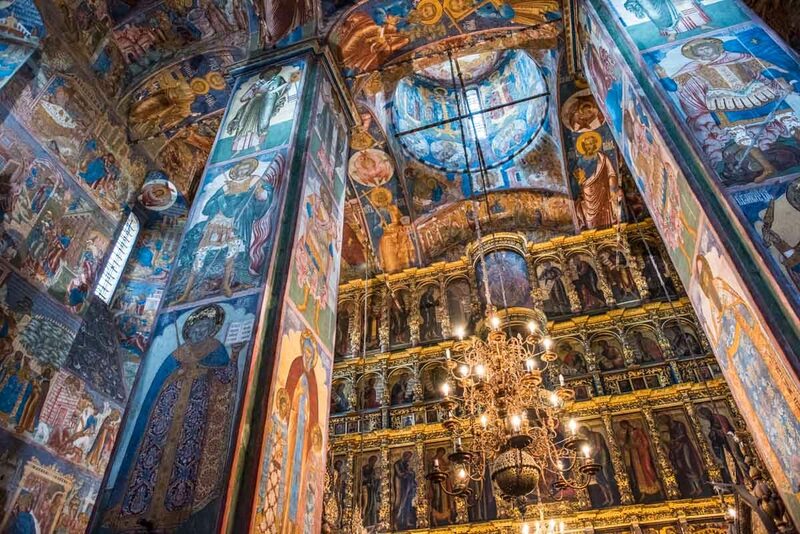 Built in the middle of the 17th Century by the patronage of the Skripin brothers, who were wealthy fur traders, Elijah the Prophet features the most elaborately painted frescoes, as well as a spectacular floor to ceiling iconostasis. The Savior Church on the City in Yaroslavl. The Savior Church on the City, was just a drive by (or walk by, as we had no time to go inside.) But, a nice profile. I liked the dark onion domes in contrast to the bright white church. The Cathedral of the Assumption. Lovely outside, but the inside is undistinguished. 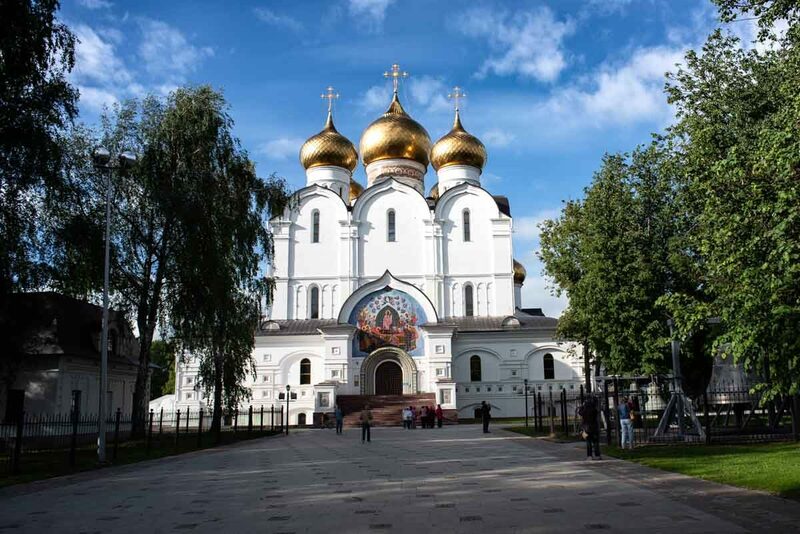 The Cathedral of the Assumption, most notable for its size and high gold domes, adds to the vistas of Yaroslavl. It’s interior, especially in contrast to the Church of Elijah the Prophet, is under decorated. 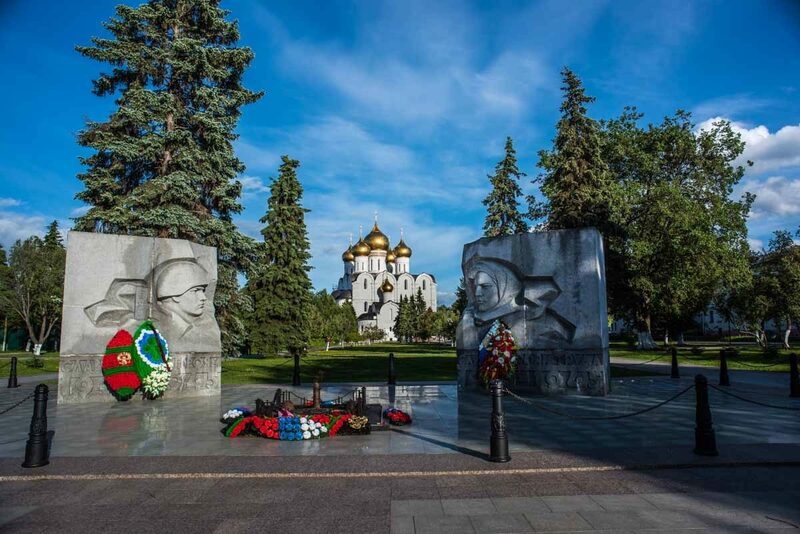 God help me, but I do like the Soviet style sculptured war memorials. That’s the Cathedral of the Assumption in the background. The Soviet style war memorial is really sort of moving, and the setting in the large green space is appropriate. It seems so peaceful. If only I were more of a meat eater, this is where I’d shop. 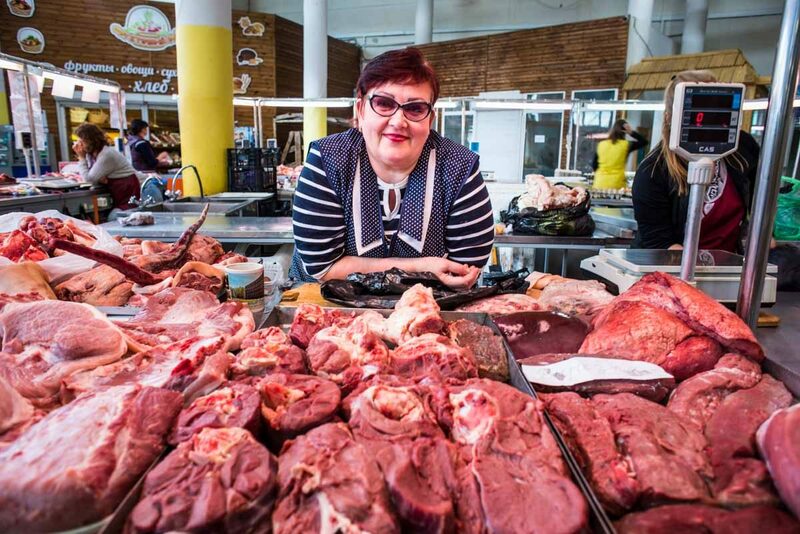 The market of Yaroslavl is where the locals get their food. A riot of smells and sights, and if I’d been staying there for any time, I’m sure I’d have been a regular. There’s the odd souvenir to be had, too. As everywhere in Russia. Finally, a promenade along the banks of the Volga provides a lovely view. Walking back to the boat provides a lovely view over the Volga. The height of the banks tells you why Yaroslavl was sited where it is. The center of Yaroslavl is a Unesco World Heritage site in Russia. 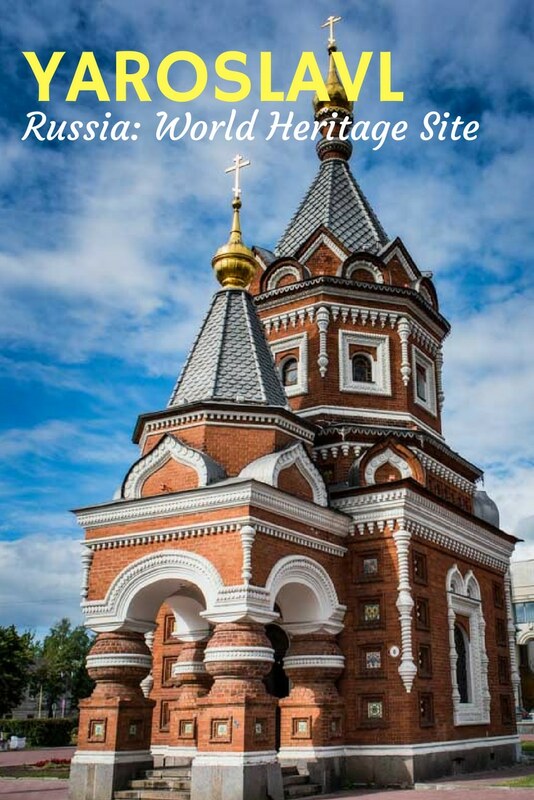 For a list of Unesco World Heritage sites in Russia, with links to the ones we have visited, click the link. Our visit to Yaroslavl was part of our cruise of the “Waterways of the Tsars” Russia river cruise with Viking River Cruises. We were hosted on the cruise by Viking, but any opinions expressed are our own. You can see a shopping list of a lot of the gear we use all in one place here on Amazon. If you buy something from this list, Travel Past 50 receives a small commission at no extra cost to you. Pin it! Or share this post using any of the social media buttons below. Such beautiful architecture! I absolutely love the frescoes. And I thought Italian churches were over the top! Not all Russian churches are “over the top.” The Assumption Cathedral in Yaroslavl was quite understated inside. But, the Elijah church and the Church on the Spilled Blood in Saint Petersburg are WAY over. That’s why I love them. Amazingly ornate decorations on all of the buildings make Russia an over the top place to tour. 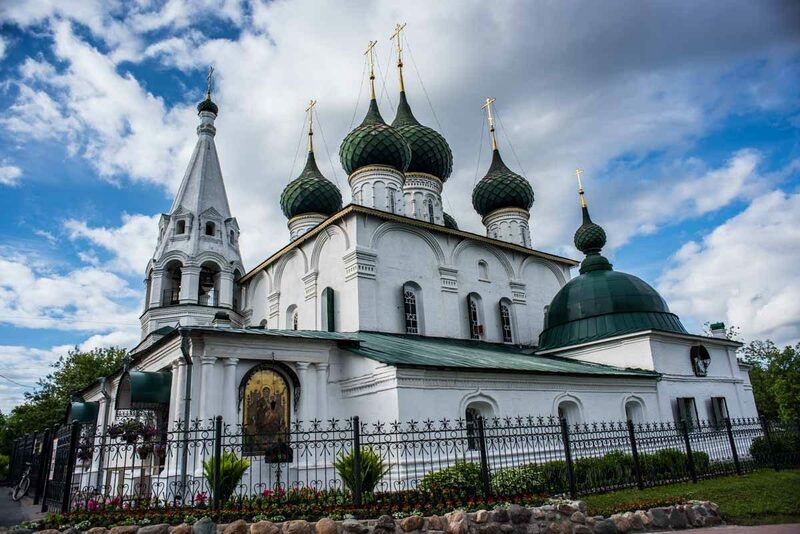 Thank you for sharing your images of Yaroslavl churches and other sites. They are amazing. The more I think of Russia, the more I think the entire country is over the top. Didn’t know about this city! I love that small chapel of St. Alexander Nevsky. If I can say cute for a Russian church… that’s how I would describe it! In this case, I think cute does the trick. But, as you say, Russian is not often synonymous with cute. Russian churches are wonderful – so ornate! I’d love to visit Yaroslavl and explore the architecture. All in all, I pretty interesting city. I wish we’d had more time. As I said last week you are serving up a hearty plate of temptation in this series of posts and as always, the photos are stunning! Russia will be there, if anything is certain. And thanks, Jackie. I was excited to read about Yaroslavl, Russia. I will be on the Viking River Cruises cruise in September and your article and excellent photos offer a preview to me; what beautiful architecture!! It’s a great cruise. I just wish the tours were a bit longer. Maybe my best piece of advice is take some time on your own and take off from the group and explore by yourself. That’s my usual modus operandi. Wow, the churches are so ornate. Looks like a splendid visit. It was splendid. As with everywhere we visited in Russia, I wish we could have spent more time.